Have you ever done a makeover that you really loved at the time, but after you lived with it for a while you realized that it just wasn’t quite right? So how many times can you do a makeover of a makeover? In my world as many times as it takes. It’s not about getting it perfect. Honestly, I’m never striving for perfection. It’s about getting it so it feels right… like it’s supposed to be. I should have called this post a makeover of a makeover of a makeover. lol. 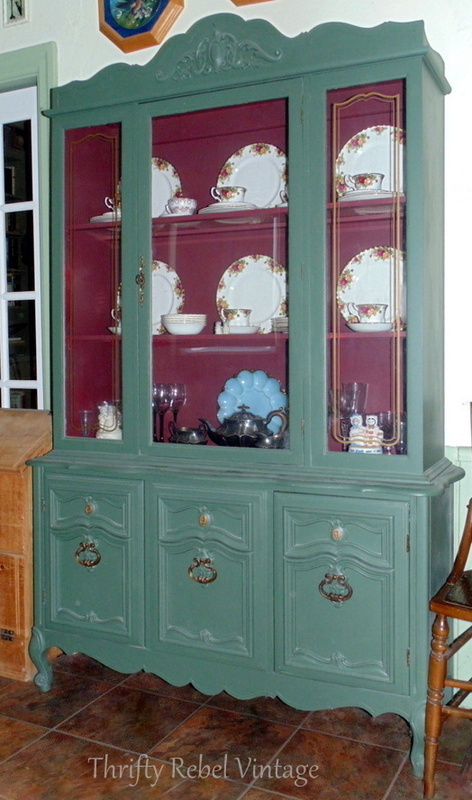 This was the before of my kitchen china cabinet. I did this makeover probably 15 years ago or so. 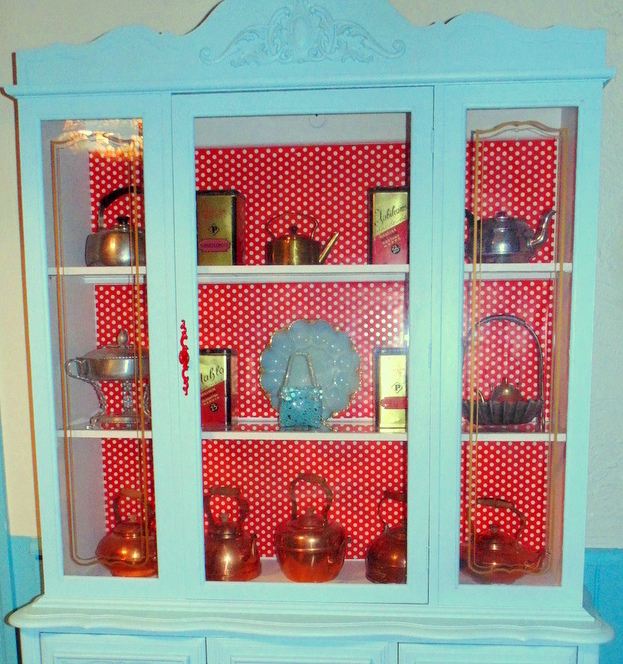 This is the china cabinet makeover number two that I did a while back…. after I quit in the middle of makeover number one because it just wasn’t working. 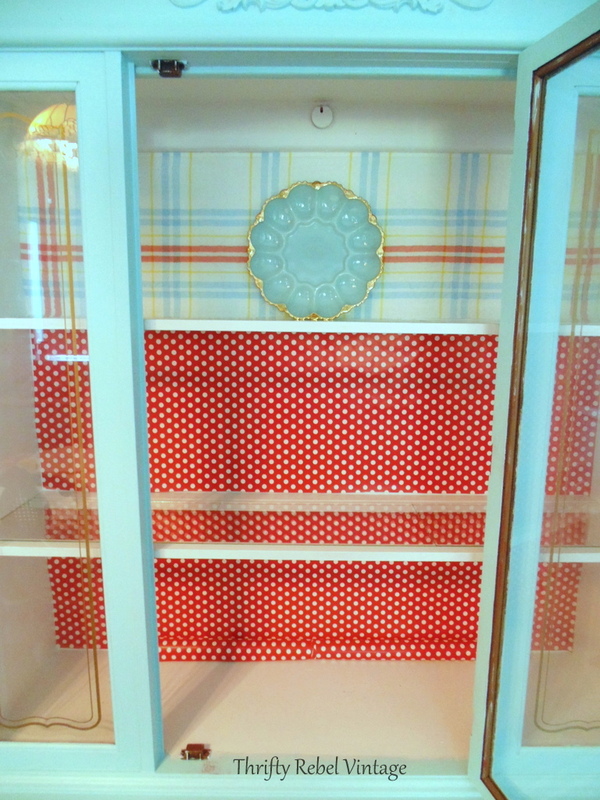 I loved that the red and white polka dot wrapping paper was so fun in an I’m the star of this show kind of way, and the combo with the aqua paint colour of the cabinet was exactly what I thought I wanted. I absolutely loved how the china cabinet looked when it was empty, and it stayed empty for awhile because I just loved looking at it. Then one day I decided it was time to put some things inside it, and I was quite surprised to discover that I didn’t love the polka dot paper as a backdrop at all. It needed to be a back up singer, but it was still trying to be the star of the show. It was way too busy for my liking, and the things that I wanted to be the stars looked a little lost to me. 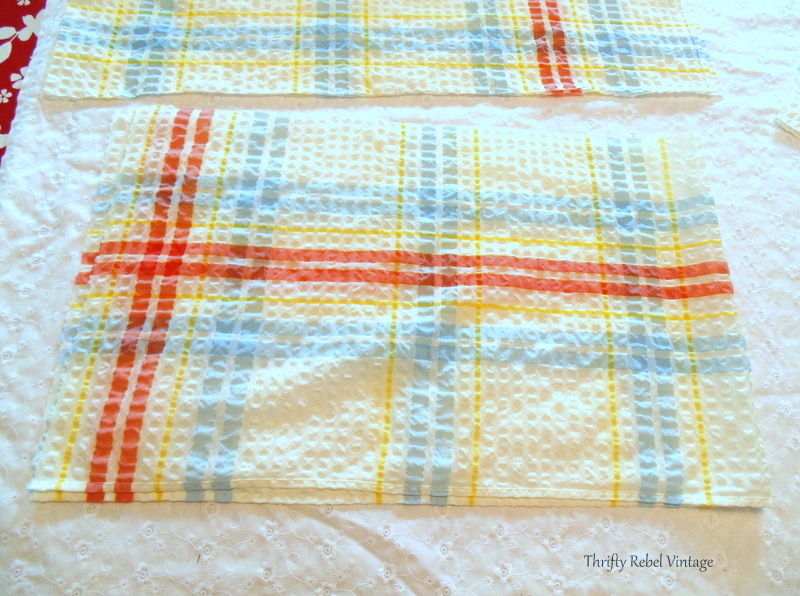 So when I found this funky textured $1 tablecloth I thought it would work perfectly for this makeover of a makeover. I measured and cut my tablecloth pieces to fit inside the cabinet, just like I did with the wrapping paper,. Once I got the top area replaced I knew this was the right decision. 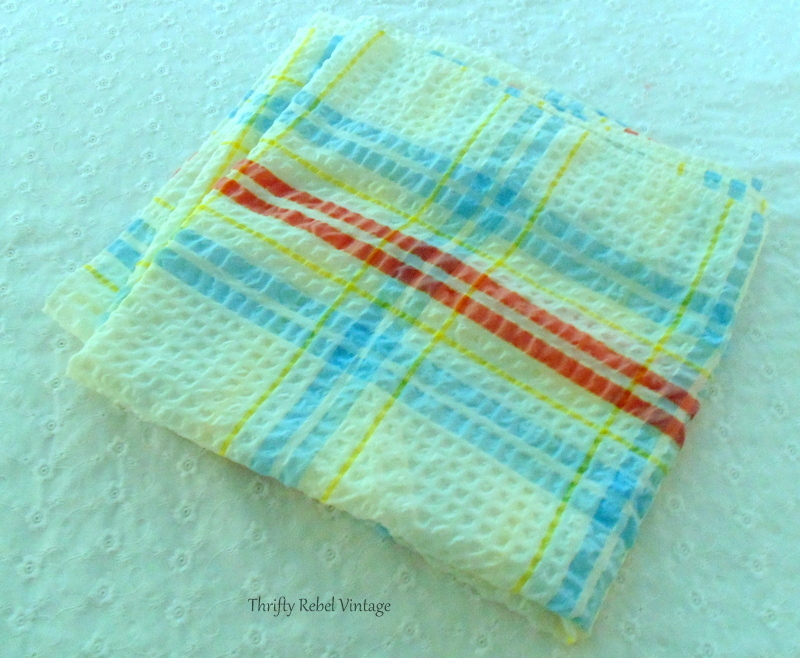 I used double sided tape just like I did with the polka dot wrapping paper. The tablecloth has the red and blue of my kitchen, but also the yellow that I’ve already added into the room with these spray painted glass vases. It went from the spotlight stealing polka dots…. … to this spotlight sharing tablecloth. Don’t feel too sorry for the polka dots. I found a much better place for them to be the star and I’ll be sharing that project later in the week. 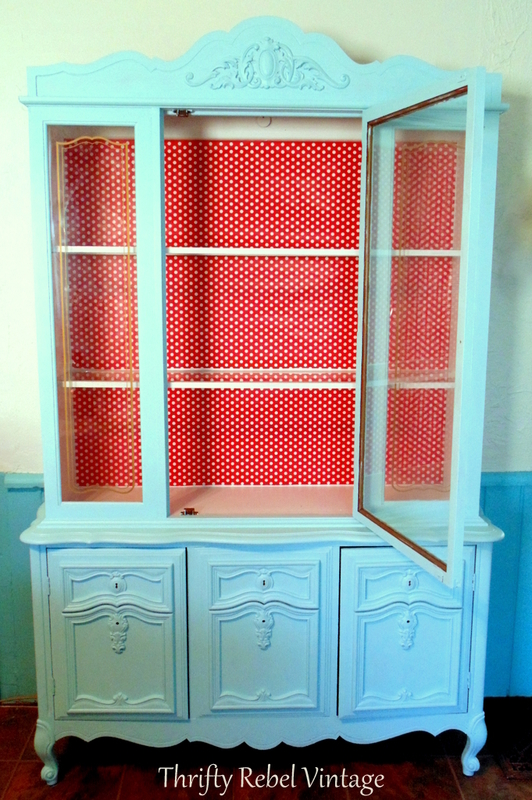 In time I’m hoping to fill this china cabinet with some colourful dinnerware… some yellows, and blues, and reds. Maybe fiesta ware, if I ever find any. So if you’ve ever done a makeover that you discover you don’t love so much, for whatever reason, it’s never too late to give it another go. But I do have to say that I’m really hoping that this makeover of a makeover of a makeover will be made over no more. Hopefully, the third time’s the charm. Thanks Christina! 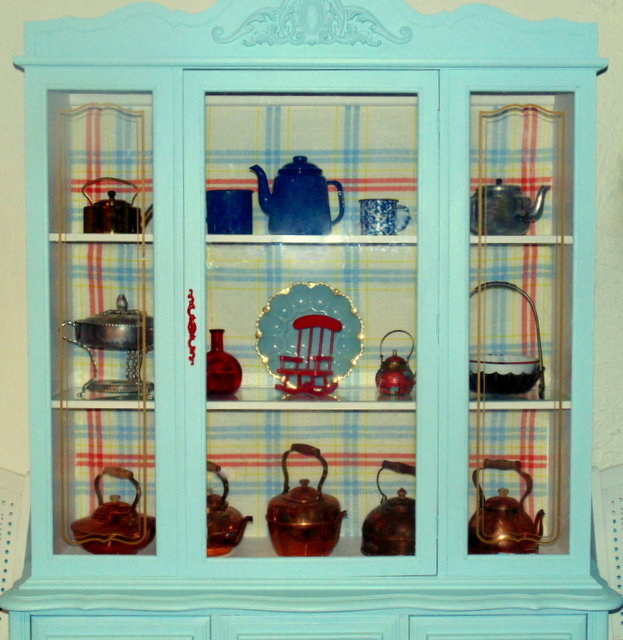 I feel much better about the china cabinet now, and it still has the colours I love. lol. 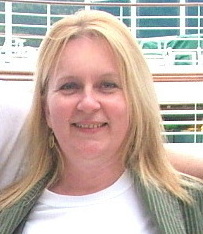 I’d be happy with 15 years Dona. 🙂 I didn’t think about the polka dots either, and I’m so glad that I went ahead and replaced them. It was so easy, and it really makes a huge difference. Fiesta were would look smashing in there. ?
? Polls dog…..polka dots. Sheesh! Like them both Tuula but I think I like this new one a little better. Very pretty. 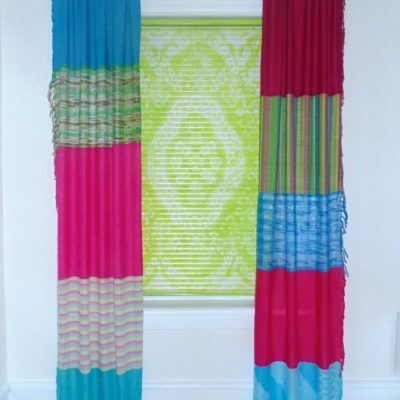 Great re love of a previous makeover. Happy New Week. Thanks very much Kris! Even though I do love polka dots, I really prefer this one too. You nailed it this time! I loved your polka dots, but with the items inside there was just something a bit jarring about it all. I couldn’t put my finger on why, but you clarified it exactly. I think 3rd time’s a charm. This one has a kind of nostalgic, retro, restful feel to it. Thanks very much Fran! I agree. 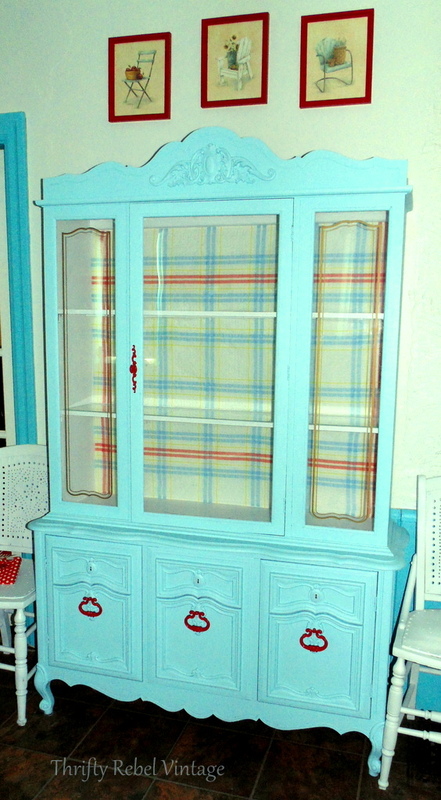 with you.. this one is much more restful, and has a more retro look that suits my kitchen better. The polka dots will look better on a smaller stage I think. Like you say, the polka dot paper was the star of the show. I like this one better too. Now you can be a little freer with what you put in it. Thanks Florence! I agree. 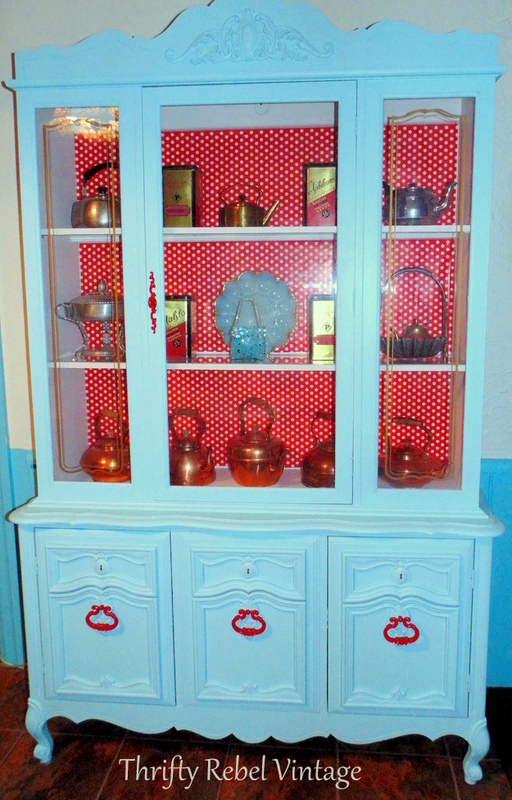 Even though I loved the polka dots on their own they were kind of limiting my options of what to put in the cabinet. 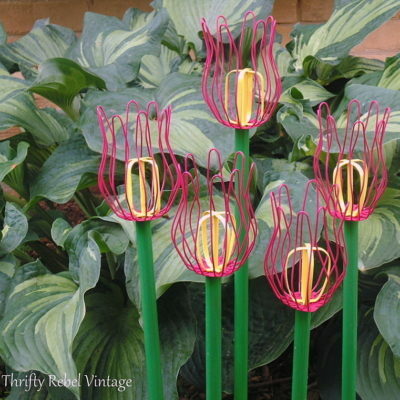 Find cheap dinnerware that looks like Fiesta and spray paint them in the colors you want……oh, you wanted to use them? My bad! Love it Tuula, sometimes the first go round just isn’t right! The third makeover is perfect, I love it! Tuula, I like the new look better. Now don’t get me wrong, I love the red polka dots so I’m anxious to see where you are going to use them. Thanks Sharon! 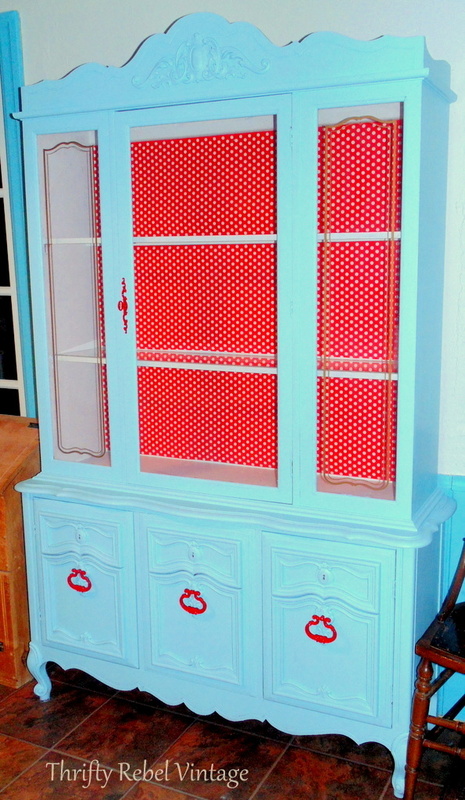 I love polka dots too, but I’m also happy that I moved them onto another project.